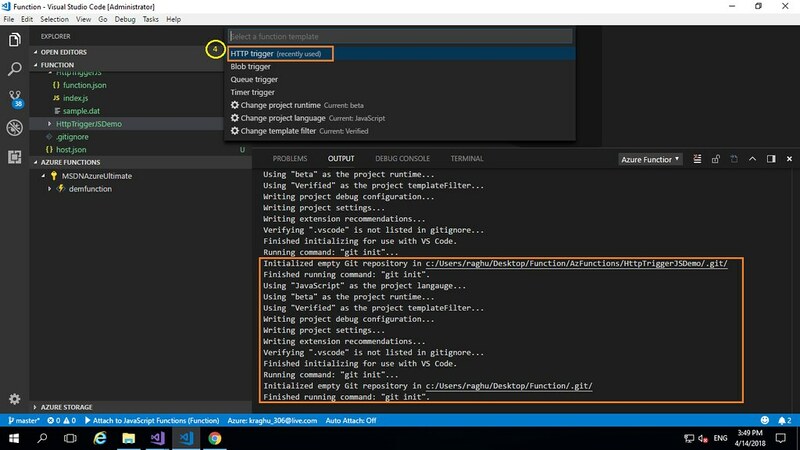 Note: To enable local debugging, you need to install the Azure Functions Core Tools. For macOS, install using Homebrew. For Windows, install using npm. 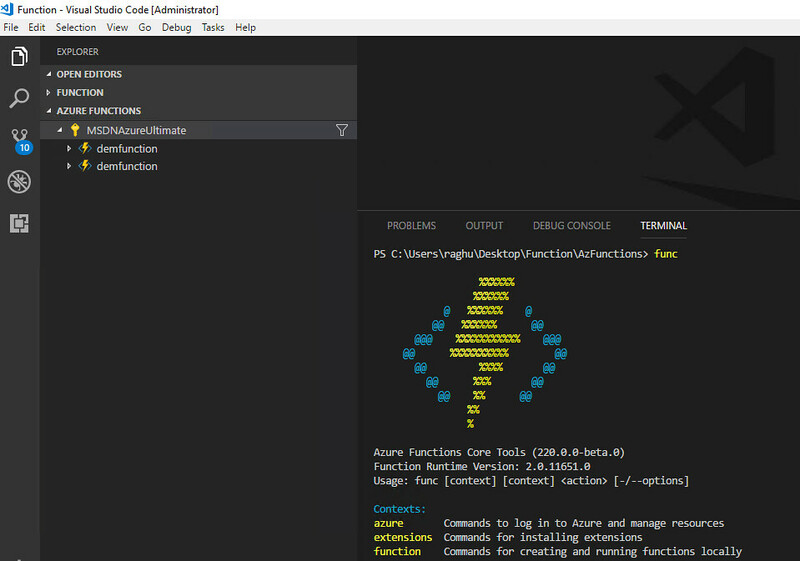 Once the extension is installed, log into your Azure account - in the AZURE FUNCTIONS explorer, click Sign in to Azure... and follow the instructions. Once logged in we should see our Azure email address in the status bar and the subscriptions in the AZURE FUNCTIONS explorer. Next, Choose a HTTP trigger Function for your function app and choose Anonymous authentication. Function app includes index.js and functions.json files. The index.js file contains the source code that responds to the HTTP request and functions.json contain the binding configuration for the HTTP trigger. Once done, let's run the function app locally by pressing F5 which will launch the app locally and attach to the Azure Functions host(which is the same runtime that runs on Azure). Now we can navigate to http://localhost:7071/api/HttpTriggerJS and pass the query parameter for the response, add ?name=<yourname> to the localhost URL in the browser to see the response. NOTE: You can also set a breakpoint(by pressing F9) when running locally to test any changes just as we do in Visual Studio. Typing a unique name for the Function App. Choose Create New Resource Group, type a resource group name, like myResourceGroup and press Enter. Choose a location in a region near you or near other services you may need to access. Choose to Create New Storage Account, type unique name for creating new storage account which will be used by the function app. Note: Storage account names must be less than 24 characters in length and should contain lower case and valid characters. 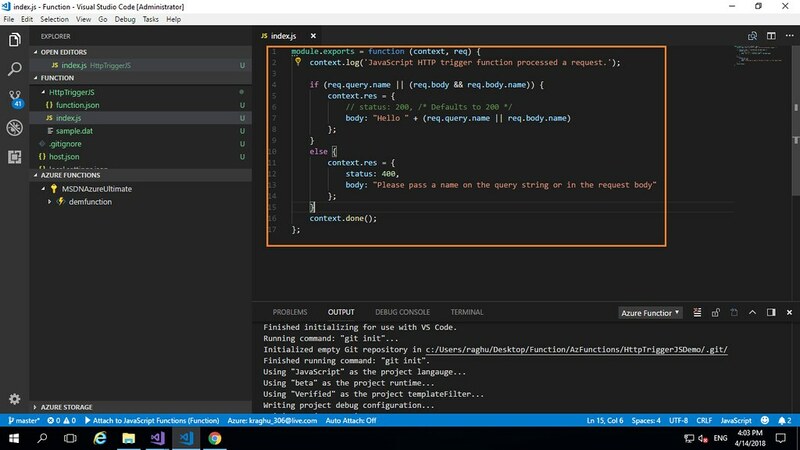 VS Code will create the Function app along with storage account. We can check the Output panel which displays all the Azure resources that were created in the subscription. Once deployed successfully we can navigate to the Function App endpoint and pass the query parameter for the response, add ?name=<yourname> to the Function Endpoint URL in the browser to see the response. Finally, we've successfully completed the creation and deployment of Function App using VS Code..! Thanks for Reading..!! Do follow my blog for more stuff on Azure. Most of my time I spent working on Azure and contributing to Microsoft Azure and other Open Source Communities. I am passionate about Technology and helping people in embracing it to the fullest.